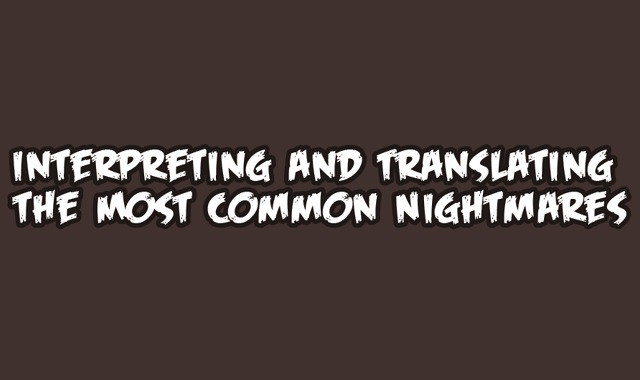 Interpreting and Translating the Most Common Nightmares #infographic ~ Visualistan '+g+"
Have you ever woken up from a bizarre, terrifying nightmare and wondered what it meant? If you have ever been jolted awake in a cold sweat by a dreaded nightmare, you know how bewildering and disturbing they can be. Do you dream of being chased, or being caught naked in public? Nightmare topics range from mundane like missing an important test to earth-shattering, like the death of a loved one. Psychologists, psychiatrists, scientists, and regular folk have all theorized and studied the meaning of dreams. Of course, the fuel for nightmares is deeply embedded in your psyche, which makes them and their meanings utterly unique to you. However, many agree that there is often a basis for the emotions that may spawn a nightmare. Upcoming big changes may make you dream of death, and anxiety may trigger a teeth loss dream. The possibilities are truly endless. This infographic from Sleepopolis explores possible explanations for 11 common nightmare themes.